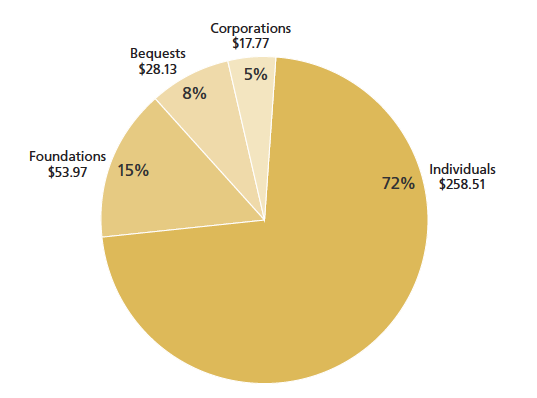 US corporate giving accounts for a paltry 5% of overall charitable giving. Does it really make sense to spend your valuable time, energy and resources cultivating business and corporate funding? Yes! If you’re fundraising smart, business and corporate partnerships can add immensely to your organization’s bottom line. 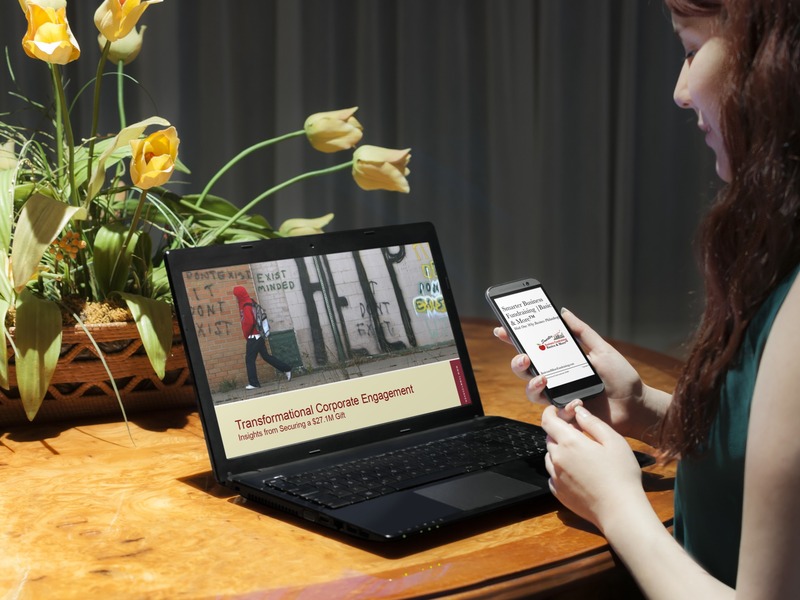 Introducing Smarter Business Fundraising | Basics & More™ where you’ll learn how to fundraise smart with local community businesses, master the strategies behind corporate sponsorships, and more. In this four-week multi-media online course, we’ll cover direct giving, corporate foundations, cause marketing, matching-gift programs, corporate volunteering, in-kind donations, and creative ways you can engage local businesses (with little to no cost to the business!). Taught by Pamela Grow, founder of Basics & More™, and Linda Lysakowski, ACFRE, author of Raise More Money from Your Business Community, Smarter Business Fundraising is a practical course that will help you develop a plan to raise more money from your local business community right away. This four-week course includes recorded webinars. Week One (June 6): Why Business Philanthropy? What do corporate sponsors really want? What do you need to include in your pitch? How can you write a good sponsorship proposal? Where do you go to meet sponsors? In Week Two, you’ll learn what corporations and businesses are looking for in the charities they support. Your Week Three module includes a bonus recorded webinar, Fundraising with Businesses for Wicked Small Shops, from cause marketing genius, Joe Waters. In this session we will outline everything you need to do to run a successful annual business appeal, including how to recruit volunteers, where to find them, how to organize them and how to keep them involved and excited about your organization. The price for the four-week course is $87! Your one-time registration fee includes as many members of your team, including board, volunteers, and staff as you would like to include. This course is taught by Pamela Grow, founder of Simple Development Systems | The Membership Program and Basics & More Fundraising, and Linda Lysakowski, ACFRE. Linda is one of slightly more than 100 professionals worldwide to hold the Advanced Certified Fund Raising Executive designation. 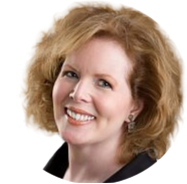 In her nearly twenty-five years as a philanthropic consultant, Linda has managed capital campaigns, helped hundreds of nonprofit organizations achieve their development goals, and trained more than 32,000 development professionals in Canada, Mexico, Egypt, Bermuda, and most of the fifty United States. Linda is the author of Recruiting and Training Fundraising Volunteers; The Development Plan; Fundraising as a Career: What, Are You Crazy? ; Capital Campaigns: Everything You NEED to Know; Are You Ready for a Capital Campaign? workbook, Raise More Money from Your Business Community; Raise More Money from Your Business Community This Year workbook, Fundraising for the GENIUS 1st and 2nd editions, a contributing author to The Fundraising Feasibility Study—It’s Not About the Money and YOU and Your Nonprofit Board, co-editor of YOU and Your Nonprofit and The Nonprofit Consulting Handbook; and co-author of The Essential Nonprofit Fundraising Handbook , Nonprofit Strategic Planning, The New Donor, and The Leaky Bucket: What’s Wrong With Your Fundraising…And How You Can Fix It. 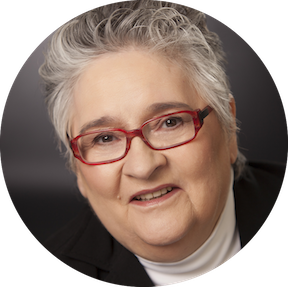 In addition to her consulting and training practice, Linda serves as Acquisitions Editor and Marketing Editor for CharityChannel Press and For the GENIUS Press. Pamela has raised hundreds of millions over the past 15 years via her widely-read weekly Grow Report ezine, her affordable and popular Basics & More eCourses, and her membership program. Her over-riding goal is to provide exceptional donor-centered fundraising training to small nonprofit organizations — at prices they can afford. Together with Chris Davenport, Pamela conceived The Donor Retention Project, the definitive series of interviews with the world’s leading donor retention experts. In 2010 Pamela was named one of the 50 Most Influential Fundraisers by the influential Civil Society magazine. She was recently named one of the Top 50 Most Effective Fundraising Consultants by the Michael Chatman Giving Show. She’s been featured by the Chronicle of Philanthropy, the Foundation Center, and NonprofitPRO. She is a regular contributor to SOFII, the showcase of fundraising innovation and inspiration, and Charity Channel. Not enough hours in the day? We’ve got you covered. With Basics & More™ fundraising fundamentals ecourses, you’ll be integrating training into your daily schedule in a thoughtful, methodical way that creates real change. Basics & More™ eCourses have provided stellar training to over 4,000 nonprofit professionals on topics including stewardship (Power of Thank You), direct mail fundraising, monthly giving, nonprofit storytelling, online fundraising, foundation fundraising, major gift fundraising, writing your fundraising case for support, and more. Often imitated but never duplicated, Basics & More™ are the leaders in the industry because they work. There are no live webinars you need to be present for. All podcasts and recorded trainings are available on demand. And, once you register, the materials are yours to keep, to re-use when you need a refresher, or to share with a new volunteer or staff member. So even if you can’t go through all of the class materials right now, you can read and listen at your leisure. There are no tests or quizzes, only solid information that you can review whenever you are ready. Read about how one participant fit a Basics & More™ course into her busy schedule by clicking here. Studies have shown that approximately 5% of conference attendees actually act on what they’ve learned. Based on fundraising best practices and the latest research in brain science behavior, Basics & More™ fundraising fundamentals eCourses have been created to guide you incrementally towards implementing positive change. When you enroll in a Basics & More™ eCourse, every Monday morning, you’ll receive (via email) comprehensive guides, worksheets, recorded podcasts and webinars, covering the topic of the week that you can read on your computer, smartphone, tablet or e-reader, or print out to read at your convenience. 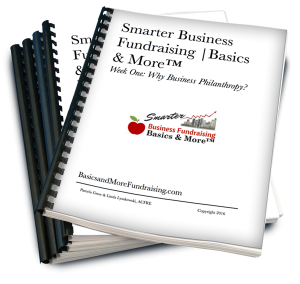 Each guide contains 10-30 pages and presents everything you need to know to grow your organization’s fundraising. All participants in this course have direct email access for questions about the course materials and how they apply to your non-profit. Ask one question or one hundred questions… we’re here to help your organization succeed. You’ll also be included in a private ‘members only’ Facebook group, the ideal opportunity to bounce ideas or questions off your colleagues. Your success is my ultimate goal. If, for any reason, you are dissatisfied with this course, we offer a full 100% no-questions-asked, money-back guarantee.